It is unlike any other military cemetery in the United Kingdom, for not only is it set on hills and small valleys in natural surrounds, but here, at rest, lie fighting men of nine nations, who have served and died in Aldershot. During both wars, numerous regimental and corps depots were based in and around Aldershot. At the outbreak of The First World War, if was the headquarters of the Aldershot Command and of the 1st and 2nd Divisions, and the Depot of the Royal Army Medical Corps. The North and South Camps, divided by the Basingstoke Canal, remained in full activity throughout the War. During the Second World War, some 400,000 Canadian servicemen were trained there. Aldershot Military Cemetery is a permanent military cemetery, the property of the Ministry of Defence. The Commission is responsible for the care of graves of both world wars within the cemetery. There are 690 First World War graves in the cemetery, the earliest bears the date 5th August 1914, and the latest 11th August 1921. Many of these graves are in plot AF. The 129 Second World War graves are in groups in various plots, the largest group in plot A containing 86 graves. and is bordered to the south by Ordnance Road. Entrance from Gallwey Road, near where the old time-gun stood. Those who participated and lost their lives in the Liberation of the Islands in 1982 will always be remembered with gratitude and the many memorials around the island are important focal points for us. 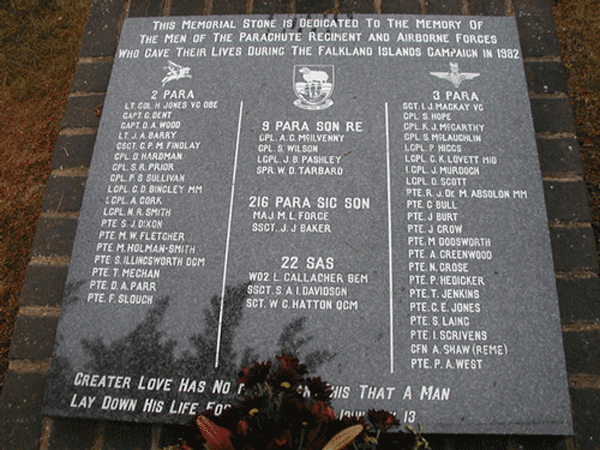 One of the most moving ceremonies during the visit of HRH the Prince of Wales, in March this year, was when he laid a wreath at the Parachute Memorial at Goose Green. The Cemetery was first enclosed in 1856, and although a number of soldiers were buried on the site prior to that year, soldiers and their families were interred in the churchyard of the village parish church of St Michel's prior to then. In 1870 the cemetery became the responsibility of the senior Royal Engineers Officer in "The Camp." The Protestant portion of the cemetery was consecrated by Samuel Wilberforce, the then Bishop of Winchester, on 1 November 1870. 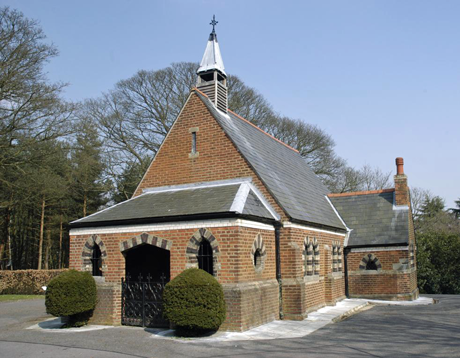 The Mortuary Chapel was built in 1879 on newly acquired ground that had previously been used as a signal post. It replaced a wooden chapel built lower down the slope at the time the cemetery was first opened. possibly this was how this land was in the days before "The Camp" was built and before the cemetery was opened in 1865. The graves themselves are mostly set amid the fine textured close-cut turf, the cemetery being bordered as a whole, by holly hedging. The most western part of the grounds, where some of the earliest headstones are to be found, has been intentionally allowed to become overgrown. The loftier parts of the ground offer pleasant views of the Surrey heathlands, that form some of the Army training grounds. Here, in surroundings familiar during their soldiering days, are the graves of the fighting men of all ranks and many nations, who have served, lived and died in Aldershot. Some of service personnel having died in the nearby Cambridge Military Hospital, from wounds or disease contracted while on active service overseas.